From 17 to 21 October 2017, Saxony-Anhalt is presenting itself at the trade show Fakuma in Friedrichshafen. 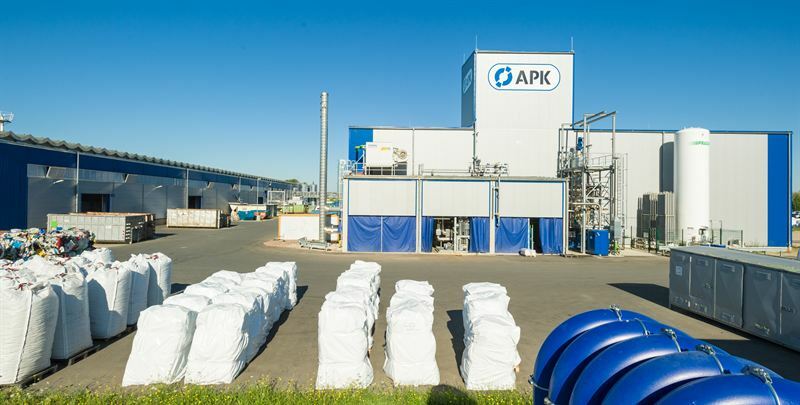 On board: APK AG, which is re-inventing plastics recycling. More than 4.5 million tons of plastic packaging are produced each year in Germany alone. Ideally, after use, the majority of this ends up in the yellow recycling bin. This is still a gigantic quantity from which precious raw materials can be recovered. Currently, however, only a good third of this is being recycled. It is intended to substantially increase the rate during the next few years, to the target level of 63 percent. But new technologies will be needed for this. A process that is currently being developed by APK Aluminium und Kunststoffe AG in the city of Merseburg, located in the south of the German state of Saxony-Anhalt, and which will soon be launched on the market, could provide a substantial boost. It makes it possible to recycle films, such as those primarily used in the food industry. Previous approaches by other processors have relied on mechanical separation. But that is very complicated. The company from Saxony-Anhalt had a different idea: they developed a chemical process in several stages. First, a solution is used and the predominant polyethylene is separated from the polyamide with a centrifuge. In the subsequent cleaning, the solvent is removed again. This leaves polyethylene and polyamide - plastics in an almost pure form. The polyethylene and polyamide obtained in this way will be marketed under the names Mersalen and Mersamid. These separated materials can then be used for new packaging. APK Aluminium und Kunststoffe has been operating in the city of Merseburg for ten years. Klaus Wohnig says that this town in the south of Saxony-Anhalt is a great site, and adds: “This is why the brand names of our Mersalen and Mersamid refer to the origin of our products from Merseburg.” The general conditions here are good, he says, and there is support from the local and district authority and state government. The only challenge is the increasing scarcity of skilled personnel. This is why, every year, APK trains a tenth of its workforce and wants to continue to grow in Saxony-Anhalt. In the ten years at the site, plastic waste has not just been mechanically recycled in the classic way; instead, work has also been done on creating new processes for plastic recycling. A plant is to go into operation in Merseburg next year. “The research work can certainly be compared with that in the pharmaceutical industry”, says Klaus Wohnig. “First, research is carried out in laboratory tests, and then it has to function on a large scale. We are working together with renowned specialists from the process industry. We needed to have machines bigger than any that had previously been built.” In the past year, 300,000 tons of film have already been processed in Merseburg in trials. The production plant is presently being further developed to be ready for industrial use. The Merseburgers see a big market for their new recycling process. “There is lots of packaging, but so far there has still not been a solution for the recycling of films”, says Klaus Wohnig. Out of the 4.5 million tons of plastic packaging in Germany, only 400,000 tons are at present recycled. In order to reach the 63 percent target, the capacities need to be substantially expanded. Many big name brand manufacturers around the world have committed themselves to sustainability, he says. This includes such giants as Pepsi, Unilever and Nestlé. The small company APK from the east of Germany could help them to live up to this commitment. With the commissioning of the new processing line in the coming year, APK wants to grow from a current 65 employees to more than 100. But that is not nearly the end of the company’s ambitions. APK wants to grow in Europe and is planning to construct a further plant in South-East Asia together with partners. “We have to go there, because South-East Asia plays a big part in the pollution of the oceans with plastic waste”, says Klaus Wohnig, explaining the expansion plans. In Asia, there is major interest in suitable and affordable solutions for dealing with the mountains of waste. It is also planned to create further plants in Europe, if the process becomes established on the market as hoped. “We want to keep the routes from the 70 sorting plants in Germany short and to avoid spoiling the air across the country with the transports”, explains Klaus Wohnig. The financing, however, is difficult, he says. Despite support from the state government, the options are limited, so APK depends on strategic partners for its expansion. IMG is the economic development agency of the German federal state Saxony-Anhalt. IMG staff provides all services related to new business sites. In addition, we are marketing Saxony-Anhalt both nationally and internationally and developing tourism concepts. We search our site and property database with 250 industrial and trade estates for a location tailored to your needs. We provide competent and individual advice for greenfield and brownfield sites, office properties or production halls. First site information provided within 24 hours. Arrangement of site visits take place following your preliminary selection. We can advise you on public grant programmes for investments, identify potential partners and arrange meetings with them. We identify a point of contact for you with the public authorities, coordinate and carry out negotiations for you on a federal state, state district and municipal level as well as with official bodies and institutions. We were assigned by the Ministry for Economic Affairs, Science and Digitalisation of Saxony-Anhalt to guide you as a one-stop agency through the investment process. Our services are free of charge for you! Food packaging films are consisting of several components. They are made from polyethylene and polyamide. Separating them is difficult, because the materials do not blend in a mixture. But our process makes it possible for both constituents to be separated, granulated and used again.